A note from the editors: We’re pleased to share an excerpt from Chapter 7 of Eric A. Meyer and Sara Wachter-Boettcher’s new book, Design for Real Life , available now from A Book Apart. You’ve seen the fallout when digital products aren’t designed for real people. You understand the importance of compassion. And you’ve learned how to talk with users to uncover their deepest feelings and needs. But even with the best intentions, it’s still easy for thoughtful design teams to get lost along the way. What you and your team need is a design process that incorporates compassionate practices at every stage—a process where real people and their needs are reinforced and recentered from early explorations through design iterations through launch. In Chapter 3, we talked about the importance of designing for worst-case scenarios, and how bringing stress cases into audience artifacts like personas and user-journey maps can help. Now let’s talk about creating those materials. The more users have opened up to you in the research phase, the more likely you are to have a wealth of real, human emotion in your data to draw from: marriage difficulties or bad breakups, accidents, a friend who committed suicide, or a past of being bullied. The point isn’t to use your interviewees’ stories directly, but to allow them to get you thinking about the spectrum of touchy subjects and difficult experiences people have. This will help you include realistic details about your personas’ emotional states, triggers, and needs—and lend them far more depth than relying solely on typical stats like age, income, location, and education. These diverse inputs will also help you select better persona images. Look for, or shoot your own, images of people who don’t fit the mold of a cheerful stock photo. Vary their expressions and clothing styles. If you can imagine these personas saying the kinds of things you heard in your user interviews, you’re on the right track. More realistic personas make it much easier to imagine moments of crisis, and to test scenarios that might trigger a user’s stressors. Remember that “crisis” doesn’t have to mean a natural disaster or severe medical emergency. It can be a situation where an order has gone horribly wrong, or where a user needs information while rushing to the airport. As you write your personas and scenarios, don’t drain the life from them: be raw, bringing in snippets of users’ anecdotes, language, and emotion wherever you can. Whoever picks these personas up down the line should feel as compelled to help them as you do. In Chapter 3, we mentioned a technique Sara used with a home-improvement chain: user-journey mapping. Also referred to as customer-experience mapping, this technique is well established in many design practices, such as Adaptive Path, the San Francisco-based design consultancy (recently acquired by Capital One). 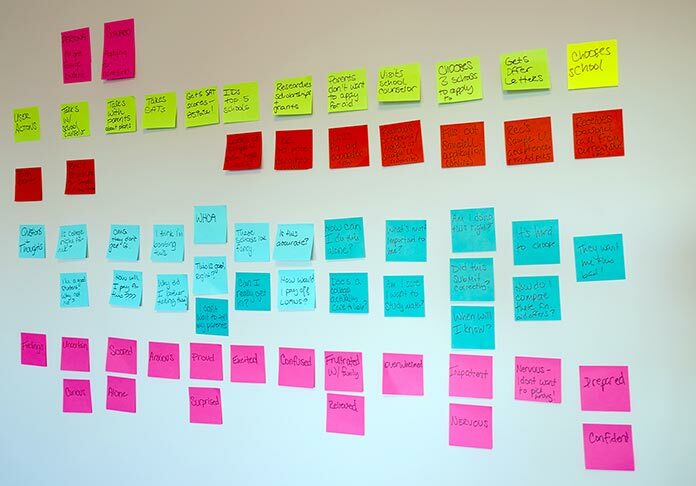 Constructing a journey map usually starts, as so many UX processes do, with sticky notes. Working as a team, you map out a user’s journey over time, with the steps extending horizontally. Below each step, use a different-colored sticky note to document touchpoints and channels, as well as what a user is doing, thinking, and feeling. The result will be a big (and messy) grid with bands of color, stretching across the wall (Fig 7.1). Fig 7.1: A typical journey mapping activity, where participants use sticky notes to show a user progress through multiple stages and needs over time. Journey mapping brims with benefits. It helps a team to better think from a user’s point of view when evaluating content, identify gaps or disconnects across touchpoints or channels, and provide a framework for making iterative improvements to a major system over time. But we’ve found this technique can also be a powerful window into identifying previously unrealized, or unexamined, stress cases—if you think carefully about whose journey you’re mapping. Make sure you use personas and scenarios that are realistic, not idealized. For example, an airline might map out experiences for someone whose flight has been canceled, or who is traveling with a disabled relative, or who needs to book last-minute tickets to attend a funeral. A bank might map out a longtime customer who applies for a mortgage and is declined. A university might map out a user who’s a first-generation college student from a low-income family. The list goes on. In our experience, it’s also important to do this work with as many people from your organization as possible—not only other web folk like developers or writers, but also groups like marketing, customer service, sales, and business or product units. This collaboration across departments brings diverse viewpoints to your journey, which will help you better understand all the different touchpoints a user might have and prevent any one group from making unrealistic assumptions. The hands-on nature of the activity—physically plotting out a user’s path—forces everyone to truly get into the user’s mindset, preventing participants from reverting back to organization-centric thinking, and increasing the odds you’ll get support for fixing the problems you find. Pain points: places where you know from research or analytics that users are currently getting hung up and have to ask questions, or are likely to abandon the site or app. Broken flows: places where the transition between touchpoints, or through a specific interaction on a site (like a form), isn’t working correctly. Content gaps: places where a user needs a specific piece of content, but you don’t have it—or it’s not in the right place at the right time. Just as you can map many things in your journey—channels, questions, feelings, actions, content needs and gaps, catalysts, and more—you can also visualize your journey in many different ways. Sometimes, you might need nothing more than sticky notes on a conference room wall (and a few photos to refer back to later). Other times, you’ll want to spend a couple of days collaborating, and create a more polished document after the fact. It all depends on the complexity of the experience you’re mapping, the fidelity you need in the final artifact, and, of course, how much time you can dedicate to the process. How to prioritize content to meet the needs of urgent use cases, without weakening the experience for others. That’s what the home-improvement store did: walking through stress cases made it easier for the team to prioritize plain language and determine what should be included in visually prominent, at-a-glance sections. Places where copy or imagery could feel alienating or out of sync with what a user might be thinking and feeling at that moment. For example, imagine if Glow, the period-tracking app, had mapped out a user journey for a single woman who simply has trouble remembering to buy tampons. The designers would have seen how, at each touchpoint, the app’s copy assumed something about this woman’s needs and feelings that wasn’t true—and they could have adjusted their messaging to fit a much broader range of potential users. Whether any gaps exist in content for stress-case users. For example, if the Children’s Hospital of Philadelphia had created a journey map for a user in crisis, it might have prevented the content gap Eric experienced: no information about rushing to the hospital in an emergency existed online. With more realistic representations of your audience in hand, it’s time to build checks and balances into your process that remind the team of these humans, and ward against accidentally awful outcomes. Here are some techniques to get you started. In many cases, the easiest way to stress-test any design decision is to ask, “WWAHD?”—“What would a human do?” When you’re designing a form, try reading every question out loud to an imagined stranger, listening to how it sounds and imagining the questions they might have in response. As you read aloud, pretend you’re talking to a real person and ask yourself “Would I say this to someone in real life?” Sometimes our writing makes us sound stodgier or colder than we’d like. That last point is an excellent tip as well, because you’ll gain a better sense of how your content might sound to a user who doesn’t have the benefit of hearing you speak. If a synthesized voice makes the words fall flat or says something that makes you wince, you’ll know you have more work to do to make your content come to life on the screen. In design, we create biases toward our imagined outcomes: increased registrations or sales, higher visit frequency, more engaged users. Because we have a specific goal in mind, we become invested in it. This makes us more likely to forget about, or at least minimize, the possibility of other outcomes. For example, say you’re designing a signup process for an exercise- and activity-tracking app. During the premortem, you might ask: “Imagine that six months from now, our signup abandonment rates are up. Why is that?” Imagining answers that could explain the hypothetical—it’s too confusing, we’re asking for information that’s too personal, we accidentally created a dead end—will help guide your team away from those outcomes, and toward better solutions. We recommend against asking for people’s title. It’s extra work for users and you’re forcing them to potentially reveal their gender and marital status, which they may not want to do. There are appropriate ways of addressing people in correspondence without using titles. By making recommendations explicit—and explaining why GDS recommends against asking for titles—this guide puts teams on the right path from the start. If user profiles are a primary part of your product’s experience, you might also want to adapt and extend the question protocol to account not just for how a department uses the data collected, but for how your product itself uses it. For example, a restaurant recommendation service can justify asking for users’ locations; the service needs it to prioritize results based on proximity. But we’ve seen countless sites that have no reason to collect location information: business magazines, recipe curators, even municipal airports. If these organizations completed a question protocol, it might be difficult for them to justify their actions. Working in teams is a powerful force multiplier, enabling a group to accomplish things each individual could never have managed alone. But any team is prone to “groupthink”: the tendency to converge on a consensus, often without meaning to. This can lead teams to leave their assumptions unchallenged until it’s far too late. Giving one person the explicit job of questioning assumptions is a way to avoid this. We call this the “Designated Dissenter”—assigning one person on every team the job of assessing every decision underlying the project, and asking how changes in context or assumptions might subvert those decisions. This becomes their primary role for the lifetime of the project. It is their duty to disagree, to point out unconsidered assumptions and possible failure states. By having every member of the team take on the role, every member of the team has a chance to learn and develop that skill. If one person is the Designated Dissenter for every project, the rest of the team will likely start to tune them out as a killjoy. Every project gets a new Dissenter, until everyone’s had a turn at it. When a new member joins the team, make them the Designated Dissenter on their second or third project, so they can get used to the team dynamics first and see how things operate before taking on a more difficult role. Our narratives are usually about total success—indeed, that’s the whole point of a design process. But that very aim makes us more likely to fall victim to planning fallacies in which we only envision the ideal case, and thus disregard other possibilities. Usability testing is, of course, important, and testing usability in stress cases even more so. The problem is that in many cases, it’s impossible to find testers who are actually in the midst of a crisis or other stressful event—and, even if you could, it’s ethically questionable whether you should be taxing them with a usability test at that moment. So how do we test for such cases? We’ve identified two techniques others have employed that may be helpful here: creating more realistic contexts for your tests, and employing scenarios where users role-play dramatic situations. In Chapter 3, we shared an experiment where more difficult mental exercises left participants with reduced cognitive resources, which affected their willpower—so they were more likely to choose cake over fruit. Knowing this, we can make our usability tests more reflective of real-life cognitive drain by starting each test with an activity that expends cognitive resources—for example, asking participants to read an article, do some simple logic puzzles, play a few rounds of a casual video game like Bejeweled, or complete a routine task like replying to emails. After the tester engages in these activities, you can move on to the usability test itself. Between the mental toll of the initial task and the shift of context, the testers will have fewer cognitive resources available—more like they would in a “real-life” use of the product. In a sense, you’re moving a little bit of field testing into the lab. This can help identify potential problems earlier in the process—and, if you’re able to continue into actual field testing, make it that much more effective and useful. Be clear and transparent about what they’ll be asked to do, and make sure participants give informed consent to participate. Remember, and communicate to participants, that you’re not evaluating them personally, and that they can call off the test at any time if it gets too difficult or draining. After all, the goal is to test the product, not the person. Bollywood films are known for spectacular plot lines and fantastical situations— and, according to researcher Apala Lahiri Chavan, they’re also excellent inspiration for stress-focused usability testing. This method isn’t just useful for reaching Asian markets. It can also help you see what happens when people from any background try to use your site or product in a moment of stress. After all, you can’t very well ask people who are in the midst of a real-life crisis to sit down with your prototype. But you can ask people to roleplay a crisis situation: needing to interact with your product or service during a medical emergency, or after having their wallet stolen, or when they’ve just been in an accident. This process probably won’t address every possible crisis scenario, but it will help you identify places where your content is poorly prioritized, your user flows are unhelpful, or your messaging is too peppy—and if you’re already doing usability testing, adding in a crisis scenario or two won’t take much extra time. One thing you may have noticed about each of these techniques is that they’re fundamentally cross-discipline: design teams talking and critiquing one another’s work through the lens of compassion; content strategists and writers working with designers and developers to build better forms and interactions. Wherever we turn, we find that the best solutions come from situations where working together isn’t just encouraged, but is actively built into a team’s structure. Your organization might not be ready for that quite yet—but you can help them get there. Our next chapter will get you started. Hi, I’m a French psychologist. I work with business leaders or managers helping them for a better spirit in their company. There is also a very useful exercise when a team is working on a difficult project, in French we call it : “the minute of the worst”. For 5 minutes we invite team members writing or orally expressing the worst nightmare scenario that could happen … The effects are very rewarding for the group and they feel released from negative thoughts. (Sorry for my medium english). Thank you for your article! I didn’t know those techniques, thank you. I’ll try them in my company. Some excellent stuff in here, as usual for an ALA article. In client services, as an outsider coming in, I tend to play the designated dissenter role quite frequently. I don’t think enough web professionals actually do this enough and just simply execute on whatever the client thinks is best. It’s not easy to challenge the status quo but it needs to be done. Well Thanks for the tips and tricks. Well I like the concept of STRESS ROLEPLAYS. You explain it very well. I think the empathy mapping route for design is exciting, and gets stakeholders and users involved at an early stage of the project. Thanks for sharing your insight – some solid tools and practices for ‘making websites better’! This phrase is very true. No man can truly succeed when isolated from others. Great post always! I agree with the previous speaker. I really emphasise on team work in my company. Good article! I like the method of ‘Yes, and’ from Improvisational comedy as well. It forces you to always roll with the punches.. saying yes to everything that comes and adding a twist to build on it. hope it will be helpful for too many people that are searching for this tpye of content. I will try it for my next projects! Eric you are just amazing, had great writing skills and very well write down the content and may helpful for many people. Junk Hero, we provide our clients with peace of mind. Having junk lying around your living space can be a hassle. Whether you are looking to get rid of old furniture, appliances, renovation debris, or to clear out an attic or crawl space you’ve come to the right place!